Want Peace and Prosperity? Make Meaning and Make Money thru Spirit of Social Enterprise! The Global Center for Social Entrepreneurship Network (GCSEN) has launched a national demonstration pilot, The Venturator, located in the Hudson Valley to show that Millennials thru Boomers can join together to heal, renew and make America a better country through Social Entrepreneurship! GCSEN is committed to doing real work with real people to build real businesses. Rather than mimic the national multi-billion dollar presidential campaigns of candidates Hillary Clinton and Donald Trump, who spend countless hours only talking about issues; GCSEN is doing real things in real time. The GCSEN Venturator is envisioned as a combination of innovation incubator resources, coworking space for start-up ventures, cutting edge blended learning curriculum lab, and classroom. GCSEN has teamed up in an affiliation with FALA Technologies, family-run premier American manufacturing plant, to create a home for social entrepreneurs from across America who want to go the full distance from concept to commercialization. At The Venturator, GCSEN helps new and established Social Entrepreneurs who act with purpose to create triple bottom line impacts: people, profit and planet. 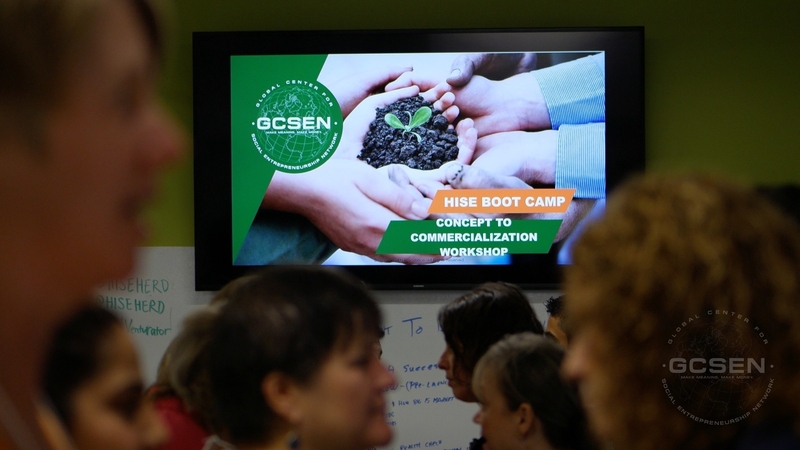 This week is the first time that GCSEN has held their globally recognized High Impact Social Entrepreneur Boot Camp inKingston, NY, at The Venturator. It takes place during Woodstock Week, in order to encourage the promotion and remaking of Entrepreneurial Woodstock. Capping the class at twenty, students are comprised of 12 aspirational Social Entrepreneurs, and 8 scaling Social Entrepreneurs. They hail from 12 colleges and universities, including Boston University, Bard College, Cornell University, University of Kansas,Babson College, and Baruch College. The entrepreneurs are so dedicated that they traveled from places like Connecticut,Chicago, Massachusetts, Michigan and Washington D.C., all coming together to Make Meaning and Make Money. Stemming from Simon Sinek, The Venturator reminds us that it’s not WHAT you do, it’s WHY you do it. GCSEN is creating a top of line like makerspace and classroom to guide people through the making of their own business, but why? GCSEN is dedicated and has the heart and passion to rebuild local and US economy with small business and Social Entrepreneurs. President Obama and major news outlets, such as Breitbart, Fox News, MSNBC, CNN, The Wall Street Journal, and The New York Times NEED to take notice! The HISE Boot Camp is thanks visionary funding from sponsors such as The Diana Davis Foundation, Sheri Sobrato Brisson, and Karen and Bob Jones Foundation. The Venturator is just one step towards improving local economies. GCSEN looks forward to rolling out online courses with MIT’sOpen EdX in October 2016.